Pittsburgh Pirates outfielder Roberto Clemente was baseball’s first Latino superstar. With his ascendancy the game became faster and the flat-footed Yankee-style of baseball became a thing of the past. 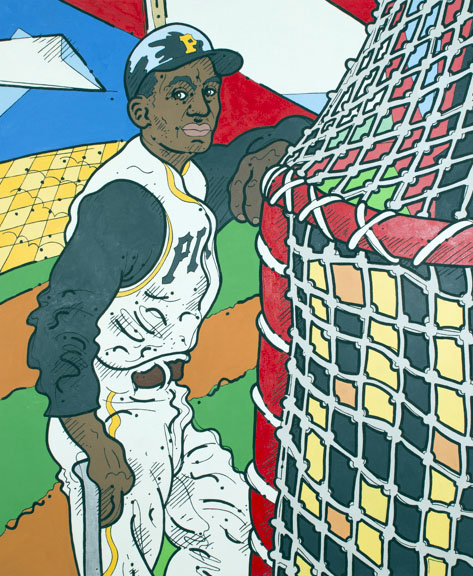 Though his organization was (and still is) racially progressive in nature, Clemente had to deal with much of the same discrimination, miscommunication and cultural disconnect that other immigrants feel. In this painting he knows we’re here to watch him hit baseballs, something he does very well. The digital numerals before him hint at the new, electronic sport that lies ahead, but here the hero waits in hokey old Forbes Field, which is shattered into the colors of the Caribbean, of major league stadium sports, and of the flag of Puerto Rico.